IRVING, TX--(Marketwire - May 14, 2008) - Mission Foods has launched four new snack products, all with zero trans fat per serving, to help curb America's insatiable snacking appetite. Mission Foods, America's leader of quality tortilla, wraps and chip products, is now offering Mission® Stone Ground Tortilla Strips, Mission® Organic Stone Ground Tortilla Chips and Mission® Caramel Twists in grocery stores nationwide. Its Mission® Super Thin Tortilla Triangles are now available in grocery stores in Texas and the Western and North Central US. According to several studies, more than 90 percent of Americans indulge in a snack on any given day making it an estimated $90 billion industry. However a growing number of consumers are becoming more "label conscious," demanding snacks that contain zero grams of trans fat but still taste great. Mission has had a long and successful history of responding to the changing needs of its consumers. "Our consumers want snacks that provide a quick energy boost but are also good for you," explains Tom Gray, Senior Marketing Director at Mission Foods. "Our consumers are loyal and when they ask for more products that can fit into their lifestyles, we respond. The new snacks are part of a variety of Mission products which already contain zero trans fat per serving." 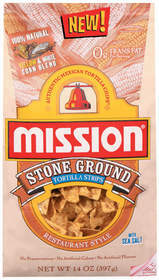 Mission® Stone Ground Tortilla Strips, made with a unique blend of stone-ground yellow and white corn to create a heartier, tastier chip. The 14-ounce bag contains zero grams of trans fat per serving. Mission® Organic Stone Ground Tortilla Chips are made with wholesome, USDA-certified organic ingredients (95 percent organic). The blend of stone-ground yellow and white corn creates a crunchy, satisfying and most importantly, organic tortilla. The 10-ounce bag contains zero grams of trans fat per serving. 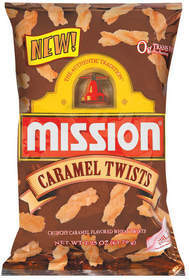 Mission® Caramel Twists are a crunchy caramel-flavored wheat snack. The 2.25-ounce bag contains zero trans fat per serving. Mission® Super Thin Tortilla Triangles are similar to the chips served at Mexican restaurants. They're made from 100 percent white corn tortillas, pressed thin, random-cut and quick fried to a delicate, crispy crunch. The 14-ounce bag contains zero grams of trans fat per serving. 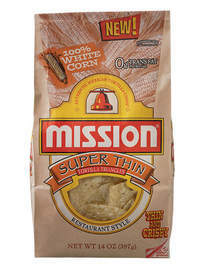 In addition to an extensive line of chips and snack products, Mission Foods is well-known for its wide variety of tortillas including multi-grain, low-carb flour and whole wheat and 96% fat-free flour and whole wheat, as well as flavored wraps such as sun dried tomato basil, spinach and garlic herb. Mission has been partnering with moms to provide quick, easy meals using tortillas, one of the most versatile items in their kitchen pantries. And for those Mission recipes that contain corn tortillas, moms will appreciate that they're naturally low fat and a good source of fiber. For great recipes and other snack ideas, log on to www.missionmenus.com. Mission Foods, headquartered in Irving (Dallas area), Texas, and Gruma S.A.B. de C.V., a Mexican corporation, was founded in 1949, and is one of the largest tortilla manufacturers in the United States. Gruma S.A. de C.V. is the parent company of Mission Foods (Gruma Corporation) and is a leading Mexican producer of corn masa flour and tortilla products. It has operations in Mexico, the United States, Central and South America, Europe and Asia. For more information, please visit www.missionmenus.com.